He he he he he… i am so cool! I have changed the world!! 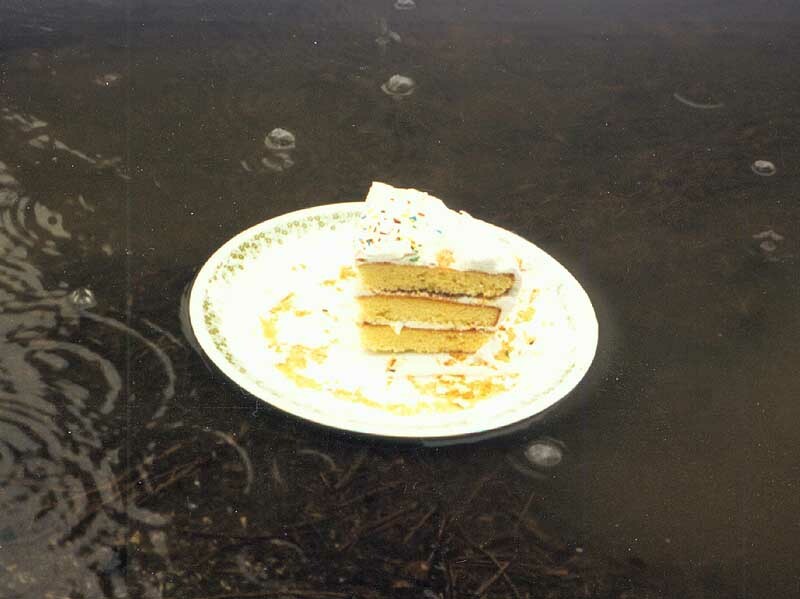 Yes Georg I know, its terrible, someone left a cake out in the rain. 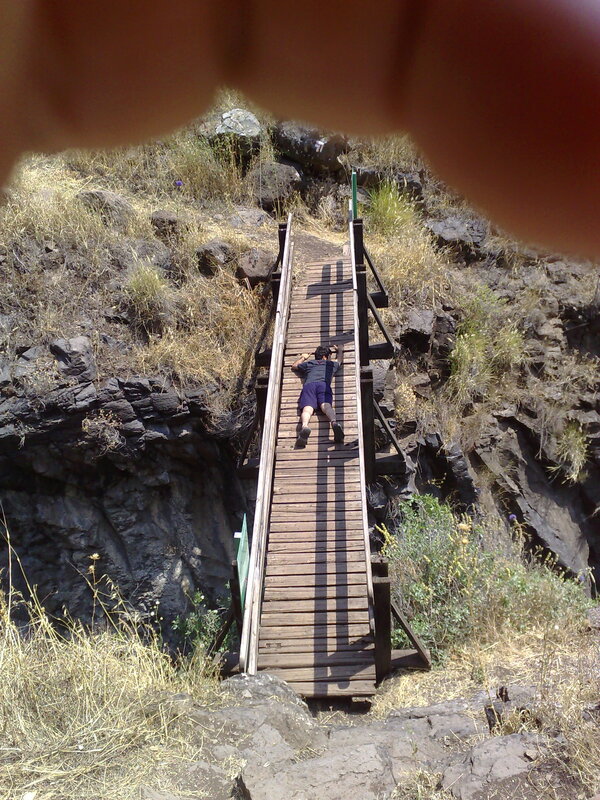 Â P.s Yes its me asleep on a bridge, there was nowhere better to sleep! Wow, Eyal, I am sure you just created a new record! 12 lines without full stop! (And Hans: No, I didn’t check the world record book or something to see if it is really a new record – I would put in a smiley here, but the blog software always locates them very randomly that there is no point). Conratulations for winning the bet with your Dad and the new contacts Eyal. As I am not as lazy with hand-in work as Hans lately is (Smiley) I sent my file to LIPA today. It was insanely expensive!!! I hope it arrives on time – I have send Ashley an email that I sent it in now, but of course he didn’t reply. (Crying smiley) It was a boring process to finish this file, but I am glad that I am done with it now, because otherwise I would have had to do it besides the everyday work and after 8 hours work and 200 kilometres on the road every day I think the result would have been … bad. 3. Working in an electronic testing facility I have learned one more thing about myself, and possibly found yet another explanation for why I love stage work so much, I hate routine…. I seriously disslike getting to work and finishing work the same times every day, it makes life really boring. In only one week it’s show time, with Ozzy comming to town and a circus to build and run, I am really looking forward to it! And I have some more of the cool jobs comming up during summer, I’ve even secured a months work from the 20th of August, so I will be returning to the pool a bit later than expected. 4. I am also working on the placement report thing, it’s going slow so I’m glad I have the extension. Hitchhiking, The dead sea, and Georg’s post! Ok so yesterday i went to the dead sea, and it was the most relaxing experience of my life, i felt like i was flying, (now hans will say “yes, causeÂ you were floating”) i know i was floating, and by flying i dont mean the weightlessness, i mean the sensation of absolute freedom, i had a competition with my father yesterday about who could hitchhike to the dead sea from Jerusalem the fastest, and if you know the geography of Israel, then you’ll realise that its not really that far at all, so i won, because i got picked up by an extremely attractive girl (because apparently im exotic even here) and my father got picked up by a group of religious jews, got into an argument with them about religion and had to walk across a bit of desert.. he he he. anyway, so the girl that picked me up was the daughter of the artistic director of the national theatre of Israel, and i had a chat with her for ages and ages, and before any of you even start to think of anything i assure you, “ich bin treu” i got an email from her father, about me working over here for a bit, which is exciting, i met him this morning for coffee, and he is interested in my new play, which i have started writing a few days ago, a tragic comedy, about 3 men who’s sons just got drafted to the army and want to join them, but cannot due to the immense differences in technology since their days in the army and now, so they decide to break into the war museum and steal one of their old tanks, it is half in english and half in hebrew, the english is the bulk of the play, but the hebrew is the flashbacks that they have about their days in the army, its about comradship, love, and the recapturing of youth! ok so i have one thing to say about Georg’s post, you didnt categorise it! quick do it before Hans sees, and hey hey hey i hope you are coming back to the pool in september, me and hans can’t watch Stargate without you… ok there are other reasons too… but mainly Stargate. 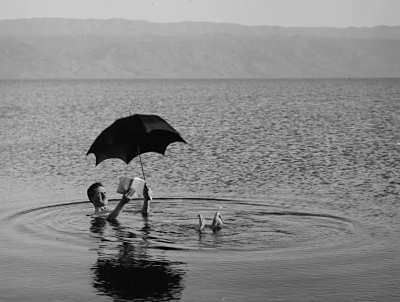 Â I have attached a picture of someone at the Dead sea, i found it on the internet, its not me or anyone i know, but its really really funny! It has been quite quiet around here I think. So here is what is going on in “Dark-Germany” as RenÃ© would say: At the moment I am working on my PPF (Placement Project File) for our Las Vegas placement. Excitement would be the wrong word I would say. It cannot express how much fun it is to collect all the stuff together. At least I wrote the wonderful evaluation about what I learned already so the hard part is over. And finally, this weekend, the open-air cinema season starts. The weather is brilliant at the moment, reaching 30Â°C almost every day now, which means there will be plenty of opportunities to watch films open-air. OK now, enjoy your time, wherever you are at the moment. Keep in touch! a great member of the society today in several hours will be leaving the country to go home to israel and some other members of the society have already ventured off into the big wide world, a mr hp in norway and the infamous mr G (minus the E) in germany its a sad time, sad indeed but there is still one german and a national of a country fond of cheese and chocolate! i shall be in israel for 17 days till the 31st of may and then will hopefully will start work of some description who knows. hey… i know you guys dont really care but i miss you guys, things feel trapped here i just want to go and direct somewhere, lets hope it happens, oh oh oh and i have been working in an art gallery and kept arguing with the staff about “what art is” anyway im not working there anymore he he he so what is everyone doing? is anyone even checking the website? the worlds greatest (and most modest) director!!! !